A first-class relic of St. John Paul has found a new home at a Philadelphia parish with a vibrant Polish community. During a March 16 vigil Mass, Archbishop Mieczyslaw Mokrzynski presented strands of the late pontiff’s hair in a golden reliquary to Father Joseph Zingaro, pastor of St. John Cantius in Philadelphia’s Bridesburg section. The archbishop served as Pope John Paul II’s personal secretary from 1996 to 2005, and currently presides over the Archdiocese of Lviv, Ukraine. The liturgy, celebrated in both English and Polish, was attended by several hundred parishioners and supporters, a number of whom dressed in traditional Polish costume. The Mass featured choral music in both languages under the direction of Wojciech Hollender, who also served as organist, and David Zagorski. 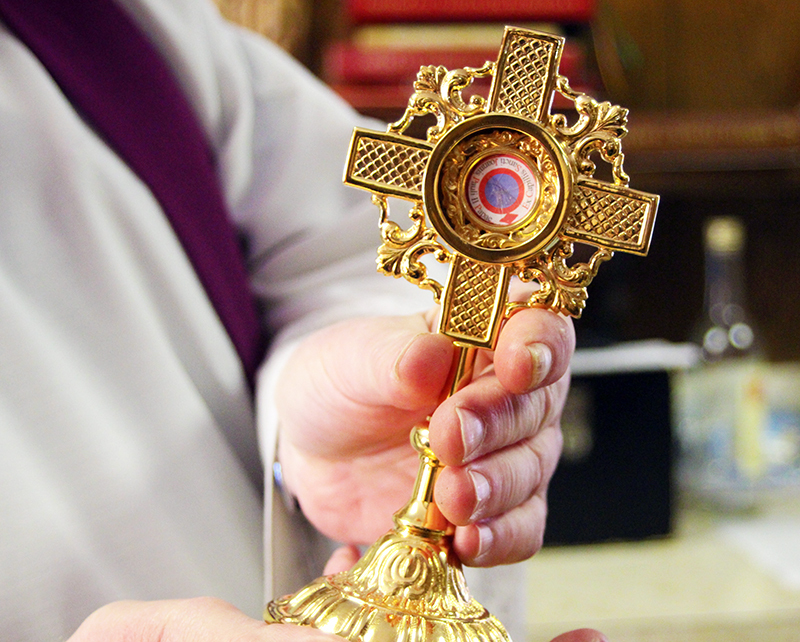 The relic found its way to the parish thanks to parochial vicar Father Konstanty Pruszynski, who met Archbishop Mokrzynski during a recent conference in New York. 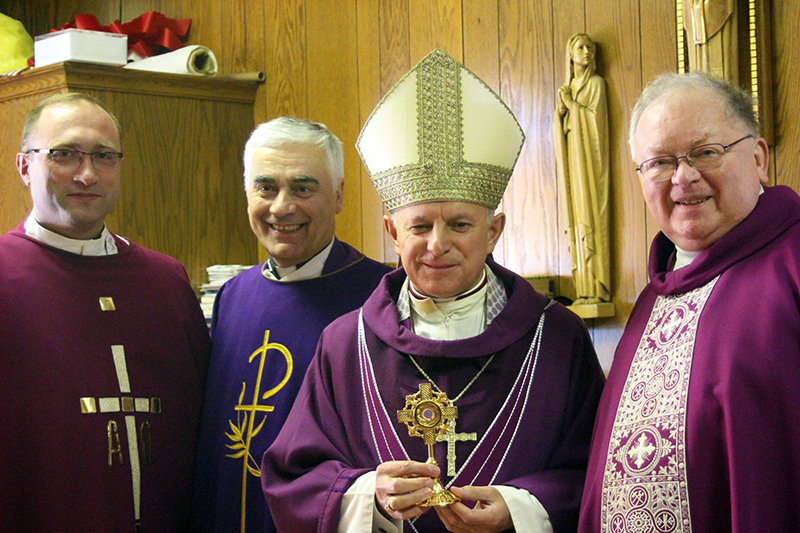 In response to Father Pruszynski’s request, the archbishop agreed to visit the parish to install the relic personally. It is considered “first-class” because it is derived from the physical remains of St. John Paul II. “It’s such a privilege to have it,” said Father Joseph Zingaro, pastor of St. John Cantius. The relic is particularly significant because St. John Paul “was a pope of our time, and we lived during his pontificate,” noted Father Zingaro, noting that the parish’s former school was named for the late pontiff. Parishioner Beata Zuk was a preteen in her native Poland when the former Cardinal Karol Wojtyla was named pope in 1978, making him the first non-Italian pontiff in more than 450 years, and the first from a Slavic nation. Zuk added that the saint’s love for his native land was evident during his first visit there as pope. Although Pope John Paul II was unable to stop at St. John Cantius Parish during his 1979 visit to Philadelphia, his relic will convey a sense of his presence to parishioners, even those who are hospitalized.